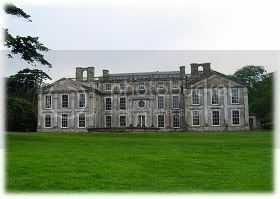 Appuldurcombe House is the impressive shell of a grand 18th century baroque style stately home of the Worsley family. The house was built in the early 1700s, replacing a large Tudor mansion left to Sir Robert Worsley. Sir Robert never saw the house fully completed as the house was greatly extended in the 1770s by his great nephew Sir Richard. The famous 'Capability' Brown was commissioned to design the 11-acre ornamental grounds at the same time as the extensions. Although partially ruined it still retains an air of its baroque grandeur - when it was the "grandest house on the Isle of Wight". The House saw many changes from the latter part of the 19th century to the present day; it was a hotel, a college and even served as an abode for a small group of Benedictine monks. The house also served as troop base during both world wars, and was badly damaged when hit by a land mine in 1943. The house has been restored from 1952 when in was saved from demolition. The ghosts however, remain. They include a phantom carriage, brownclad monks, dark shapes glimpsed flitting through the grounds. A babyâ€™s cry is heard, and unseen hands regularly leaf through pages of the visitorsâ€™ book.